Do you have deep dark thoughts? Do you wish to explore greater depths, or underground caverns and caves? I offer technical and cavern/cave training at all levels. Course fees are based on group instruction. Private instruction is $300 per day for open-circuit and $350 a day for closed-circuit. Fees are based on completing the course in the minimum number of days. Signing up for a course does not guarantee certification within the minimum number of days and unfortunately, some divers may need an extra day or two to complete a course and those extra days are billed at my daily rate. In some cases you may be asked to come back after a period of self-study/self-practice to complete a course, but we will work out a self-study routine for you to help you achieve success. Details: I hate having to say this, but a 50% deposit is due upon scheduling a course with full payment due by the beginning of the course. The deposit is refundable up to 30 days prior to the start of the course. Fees are for instruction only, and do not include certification processing fees (if earned), your fills, your entrance fees, or your books. Trimix courses will have an additional charge for helium. My philosophy on technical training is simple: I do not sell c-cards and I am not here to sell you the next course. This means that I provide training for people that are looking for advanced knowledge and skills, but you will do the work necessary to earn certification. If you are looking for a rubber stamp c-card for your collection, I am not your instructor. My promise to you is that I am committed to providing you with the most comprehensive and complete course that I can possibly teach. My courses tend to run longer, and my students spend more time in the water, but I believe this provides for a better learning experience. It’s the difference between a nice meal at a fancy restaurant versus Taco Bell (no offense to Taco Bell fans). I believe firmly in the principle of guided self-discovery. Guided self-discovery means that I will not haze you, I will not shout at you, and I will not throw in unnecessary drills, but I will let you make your own mistakes and offer constructive feedback to help you avoid those mistakes in the future. At the end of the day, I want you to understand the “why’s” so that you will be a thinking diver capable of solving real world problems on your own. I have put together a document outlining the expectations I have of all of my students, regardless of the course. You may view it here. Historically, Cavern was the first step in learning to cave dive and many people took the course in doubles or side-mount. Effective November, 2018, I will only teach Cavern as a recreational safety course for single tank divers and people that wish to take Cavern in doubles or side-mount will instead need to sign up for Cave 1. Cavern is not a cave diving course, but it is a very challenging recreational course that takes the open water diver and introduces them to the concepts and techniques used in overhead diving. The skills we will focus on include buoyancy control and fin techniques in order to not disturb silt, team concepts and team awareness, working with a reel, and stress management. This course can only be taken in recreational single tank configuration, with minor adjustments (7′ hose, backup lights, etc). The course is typically taught over 2.5 days, with the first afternoon being lecture and an equipment workshop. On day two we typically spend a full day at Ginnie Springs, learning how to run a reel on land before going into the water for at least three or four dives. On the final day we normally will go to Peacock Springs for two additional cavern dives before reviewing the final. Please note, this course is not a pre-req for Cave 1. Cave 1 is the most intense course that I teach because it takes the open water diver with some technical diving background and introduces them to the concepts and techniques used in cave diving. 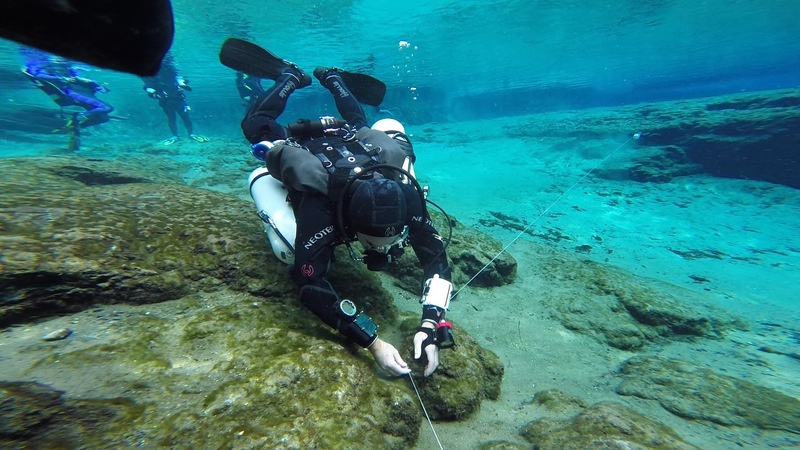 The skills we will focus on include introduction to the cave environment, buoyancy control and fin techniques in order to not disturb silt, team concepts and team awareness, working with a reel, and stress management. This course must be taken in either side-mount or doubles, single tank diving is not allowed in Cave 1. The course is typically taught over six days, with the first day being lecture, land drills and an equipment workshop. On day two we typically spend a full day at Ginnie Springs, learning how to run a reel on land before going into the water for at least three dives. We will then move on to other sites for the remainder of the course. Graduates of the course are able to dive up to 1/3rds of a set of doubles with two navigational decisions (jumps or T’s). Advanced Nitrox/Decompression Procedures with Helitrox is a course that exposes divers to decompression methods and techniques. Graduates of this course are allowed to use oxygen rich mixtures up to 100% in order to conduct decompression dives and helium mixtures to off-set narcosis. This course is taught completely in open-water locations, typically Blue Grotto, Troy Springs, and Hudson Grotto. During the course you will work with decompression cylinders and stage bottles, lift bags and/or surface marker buoys, and other equipment. The typical schedule includes one full day of lecture followed by three full days of diving. The last day of diving will include two decompression dives at depths of approximately 130′. Please note: Because of the risk of injury from either breathing oxygen rich gases deeper than their MOD, or decompression illness due to violating a physiological ceiling, I place heavy emphasis on proper buoyancy control and trim in this course. Because at least one of our decompression dives will be while simulating a “blue water” environment without any natural references, if you are unable to demonstrate proper buoyancy control by the third day, you will not be allowed to participate in the decompression dives. Pre-reqs to enroll in this course are either Intro to Cave OR Intro to Tech and a phone consultation. My first decompression dive was when I was 13 back in 1982 off the coast of Roatan Honduras. I was an idiot on that dive and did pretty much everything wrong. My first cave dive was in 1994, and once again, I did a lot of things wrong, but I was smart enough to get some training. I completed “full cave” in February 1995 with a person that was one of the most respected cave instructors in the area. My first trimix dive was also in 1995. Since the mid-90s I have been involved with exploration projects off and on, and have done several “pinnacle” dives in support of research and exploration. I have been a scuba instructor since 1995, first with the YMCA then with NAUI, TDI, IANTD and the NSS-CDS. I taught scuba at the University of Florida for close to ten years before heading out on my own. My time at the University of Florida reinforced to me that more complete and thorough courses produce safer divers. I am also an instructor trainer and can help instructors become technical/cave instructors. When I am not teaching, you will usually find me out diving for fun, or helping a research/exploration group out. My idea of fun includes scootering a mile or two back in Manatee, going for a four to six hour dive at Eagles Nest, guiding a group of former students at Jug Hole Cavern, or going to the Cayman Islands for some wall diving.